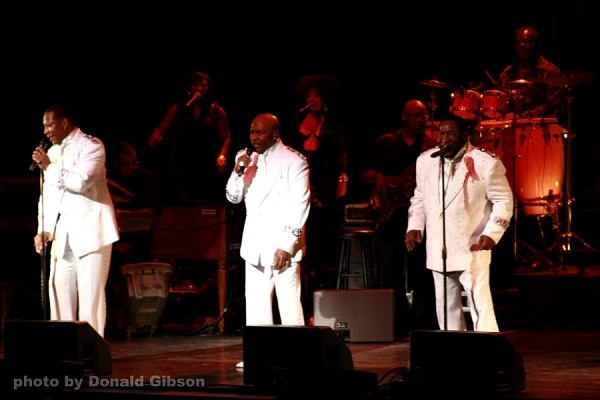 St. Petersburg showed the O’Jays lots of love this past Thursday night. So much love, in fact, that just about every song they performed met with an instant mix of feminine swoons and joyful sing-a-longs to fill the majestic Mahaffey Theater. And the Rock and Roll Hall of Famers earned that love all night. More to the point, they worked for it, spinning and gliding in synchronized steps, engaging the audience at every turn, and demonstrating a commitment to not just sing but entertain. From the get-go, with a high-energy opening medley that included “Unity,” “Survivor,” and “Give the People What They Want,” original members Walter Williams and Eddie Levert, along with relative newcomer Eric Nolan Grant—all clad in matching white, sequined suits—personified showmanship and class. Indeed, that resilience was evident and plentiful. With boyish charisma and seemingly boundless energy belying his age (he'll turn 70 in June), Levert enlivened both slowjams (“Lovin’ You," “Stairway to Heaven,” “Cry Together”) and social statements (“Backstabbers,” “For the Love of Money,” “Love Train”) with urgent, earnest conviction. The opportunity to experience in-person such legends of American music is growing increasingly scarce these days. With this spirited and superlative performance, though, the O’Jays lived up to their legacy.